Join IFMGA-certified guide Jyamchang on a 21-day trek of the complete circuit around Manaslu, the world's 8th highest mountain. A beautiful secluded route! 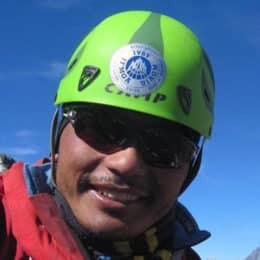 Let me welcome you to Manaslu’s newly opened route! Join me on a 21-day trek of the complete circuit of Manaslu, the 8th highest mountain in the world. Manaslu (8163 m) was first climbed in 1956 and since then has only been summited by a few westerners. 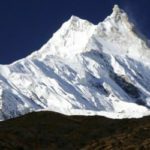 Meaning “mountain of spirit,” Manaslu is often regarded as one of the most dangerous 8000 m peaks. But because of its lack of visitors, the remote trails surrounding the mountain are quiet and unspoiled. In fact, the complete mountain circuit over the Larkya Pass is one of Nepal’s best kept secrets. There’s an incredible diversity of scenery, including sub-tropical foothills and arid high pasture. The secluded trail also passes through picture-perfect villages and awe-inspiring mountain views. On this trek, we start in Arughat Bazaar and follow the grand Buri Gandaki River to the Deng village. Along the way, the river valley grows narrower and we’ll be able to walk high above the river on scenic paths. Then we’ll trek to the north, where the valley opens once again to show lovely alpine meadows and quaint Tibetan-style villages below the north face of the Manaslu mountain. Next, we’ll reach the large village of Samagaon and start to head west across the beautiful Larkya La route (5213 m). We’ll descend through alpine meadows in Binthang and then join the popular Annapurna circuit route for the last two days of the trip. This program is suited for a fit and experienced walker, comfortable walking 4-6 hours a day with some longer days. The first half of the trek is at relatively low altitude but there are some steep parts. The Larkya La crossing is over rough glacier moraine and the descent is steep. I will help you acclimatize over the course of the trek. I also provide you with everything you need to camp. My staff includes guides, cook, and porters, so all the camp chores will be taken care of and you only need to carry your own daypack. The Manaslu circuit trek is a great opportunity to get away from the crowds and enjoy Nepal’s remote mountainous landscape. You’ll experience a beautiful mix of nature and culture on this trek. If this sounds like the ideal trek for you, don’t hesitate- send me a message now. I’m looking forward to planning our trip together. I also lead trips to Everest Base Camp and Ama Dablam. Day 4: Trek to Soti-Khola (730m) 6 hours walking. Day 5: Trek to Machha Khola (930m) 5 hours walking. Day 6: Trek to Before Jagat (1370m) 5-6 hours walking. Day 7: Trek to Philim (1570m) 3-4 hours walking. Day 8: Trek to Deng (1540m) 5 hours walking. Day 9: Trek to Ghap (2165m) 4 – 5 hours walking. Day 10: Trek to Lho (3180m) 5-6 hours walking. Day 11: Trek to Samagaon (3517m) 3-4 hours walking. Day 13: Trek to Samdo (3860m) 3 hours walking. Day 14: Trek to Samdo (3860m) 3 hours walking. Day 15: Cross the Larkya La (5213m) 7 – 8hours walking. Day 16: Trek to Tilje (2300m) 5 – 6 hours walking. Day 17: Trek to Chyamje (1390m) 5-6hours walking. Day 18: Trek to Bulbule (840m) 5 – 6 hours walking. This trek is appropriate for a fit and experienced hiker comfortable walking 4-6+ hours per day. person joined the climbing party. Acclimatisation on Lobuche gave us a foretaste of what the numerous pitches on Ama Dablam’s steep terminal slopes would feel like. Good weather conditions and a swift Alpine style climb to C1, C2 and finally the summit concluded this project. Thank you so much Jyamchang for guiding us up there! The timing of the climb (before Autumn’s commercial expeditions), choice of porters and additional logistics were once again very professional. pour qu’on atteigne nos objectifs quotidiens. Il nous faisait un briefing journalier avec le programme du lendemain et ses difficultés éventuelles et une vérification de notre adaptation à l’altitude (pouls, saturation en oxygène). Dès le premier jour, il a tout pris en charge tant du point de vue de l’organisation des transports que des hôtels sans faux pas. Mountaineering - 21 days - Interm. Hiking - 21 days - Interm.